US equity indexes closed fractionally mixed, sp +1.9pts at 2498. The two leaders - Trans/R2K, settled -0.1% and +0.2% respectively. 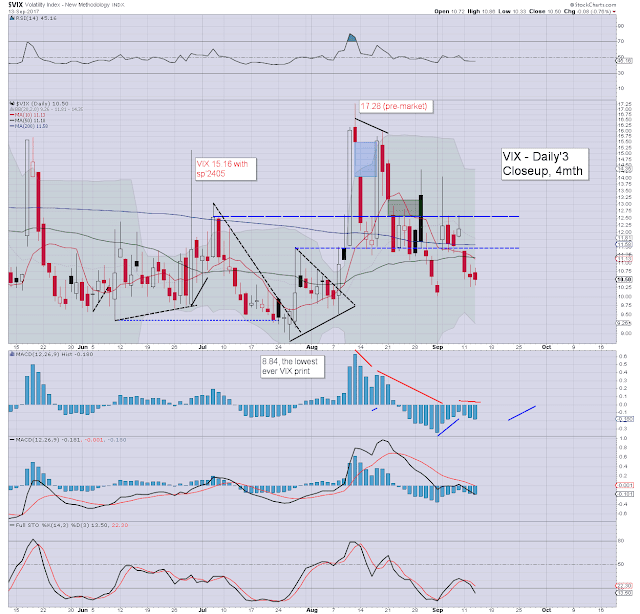 VIX settled -0.8% at 10.50. 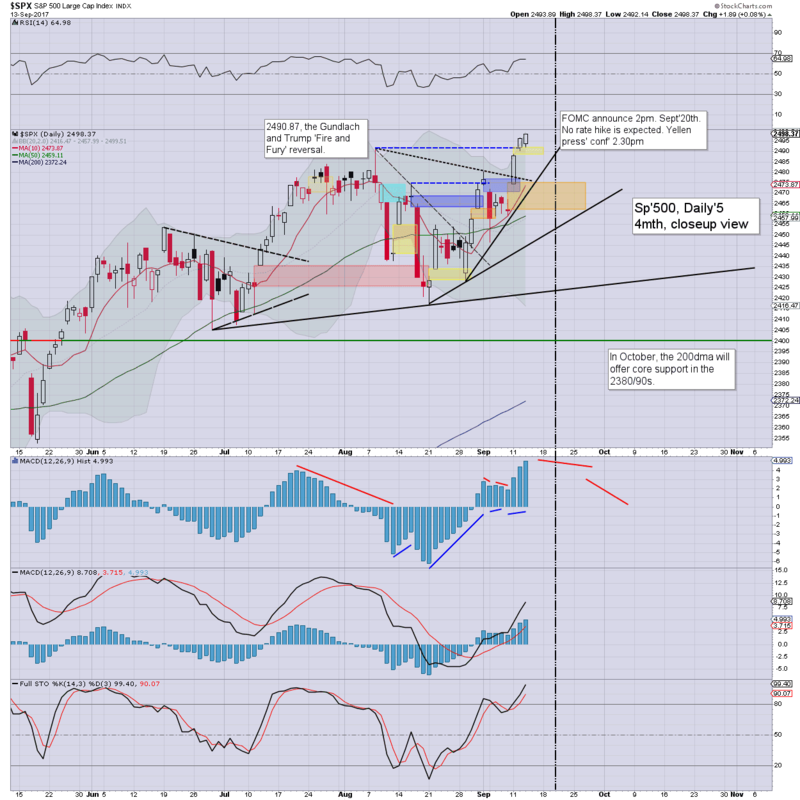 Near term outlook offers weak chop, but nothing <sp'2474 until after quad-opex is out of the way. US equities opened a little weak, but quickly slipped into micro chop mode (trading range 6.23pts), clawing to fractional new historic highs into the close. 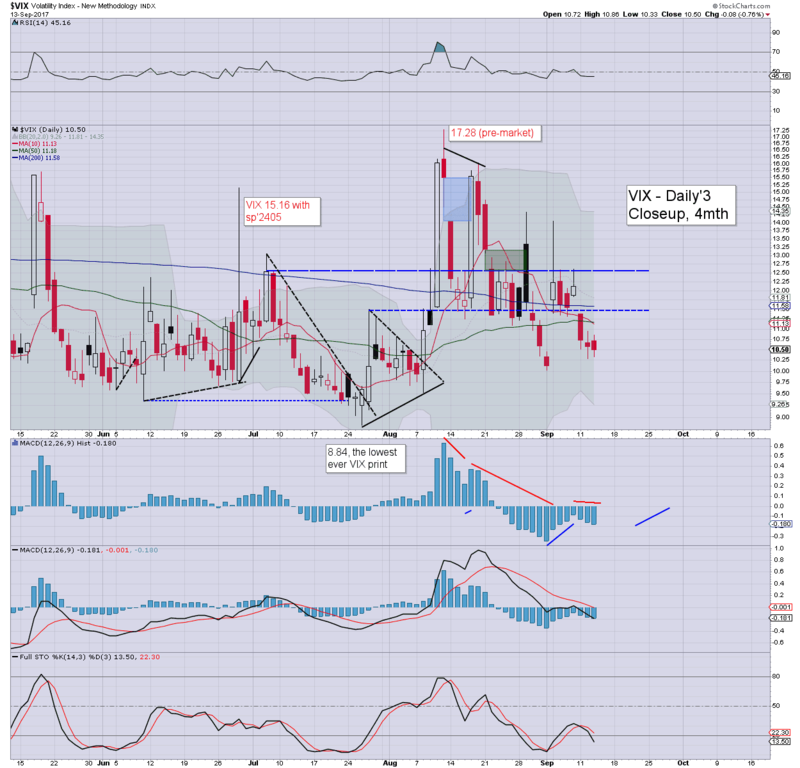 Market volatility was naturally very subdued, with the VIX stuck in the mid 10s. There remains an open gap (orange zone) of sp'2474/61, which is going to have be filled at some point. The only issue is whether that is before... or after the 2500s. Right now, sp'2474 would likely equate to VIX no higher than the 12/13s. The key 20 threshold looks probable, but not until early October. Keep in mind, we have an FOMC announcement next Wednesday afternoon. No rate hike can be expected, and that will surely be a downward pressure for the financials, which have been broadly stuck since the spring. 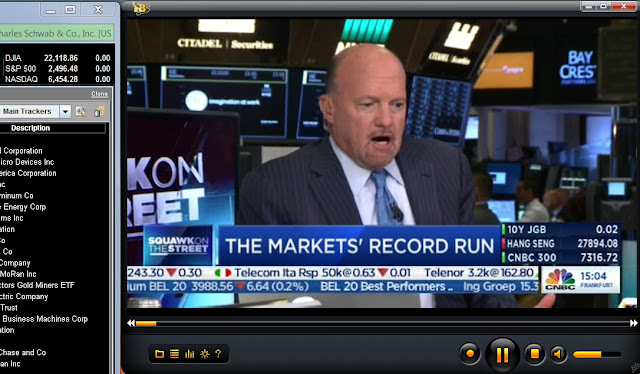 The day began with the infamous Cramer talking about how recent storm destruction in Texas and Florida was a 'net positive for GDP'. Whether you like Denniger or not, the article is soundly based. Cramer, and far worse... Paul Krugman, are both academically insane. I'd like to see either of them tell any of the 'real people' in Texas or Florida, that such destruction is a net positive for the broader economy. Certainly, some construction companies will profit from the huge amount of repair work to be done, but for the broader economy, its bizarre that anyone could deem the event 'a net positive for the economy'. Ohh, and if Q3/Q4 GDP comes in weak, its probably safe to assume those SAME people will blame the 'Harvey' and 'Irma' storms for weaker growth.